I have written in my last post the meaning of property insurance and its importance also. Our houses and properties are one of the most valued assets we have so it supposed to be well protected with property insurance. Property insurance also covers the damages you encounter in natural disasters like the earthquake that affects your home. Your property insurance premium is paid monthly in some of the countries, depending on your location along with your monthly mortgage payment. One of the importance of property insurance is that in some states you need to have property insurance, like home insurance to get a loan from most of the mortgage companies. But even though that you don’t have a mortgage, try as much possible to get your property insurance. 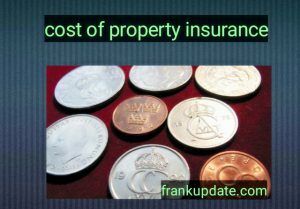 To know the cost of property insurance, there are certain things you need to consider. First get enough insurance to cover the 100% of the cost of rebuilding your home and properties when it gets damaged or destroyed. You can as well request for an actual cash value coverage which pays you the worth of the property that was damaged excluding depreciation or replacement cost coverage which is more preferable because it does not factor in depreciation. We also have extended value coverage that pays around twenty to thirty percent of your policy coverage limit. Therefore, $100,000 insurance policy might have $120,000 - $130,000 according to my research. But it is better to get a more comprehensive option that can cover 100% of the cost to maintain your home well. Also, try to know the content of your properties to know how much insurance you will want to cover. Expect to pay close to $35 per month for every $100,000 though it depends on your region. That is, people that are living close to the area that are prone to the disaster will pay higher than those living in the normal area. Also, people that add extra coverage to their policies like personal properties will as well spend more. Note that property insurance coverage can be given in a business owner’s policy by joining liability coverage’s and commercial property insurance. Businesses pay about $1,000 and $3000 per million dollars of coverage. While some may pay $1,000 annually with an average of $742. Remember that property insurance does not cover the war, because war includes terror attacks and damages from missiles or another machine of war as the case may be. Also, property insurance those not cover surefire that those not occur inside the building or when are smoke comes from a factory or farmland close to your home, property insurance will not then take place because the source of the smoke of fire is not directly from your house. REMEMBER TO DROP YOUR COMMENT AND QUESTION.